Joseph Charles "Jos" Buttler (born 8 September 1990) is an English cricketer who plays for Lancashire County Cricket Club and England. He is a right-handed batsman who also plays as a wicket-keeper and is the current vice-captain of the English limited-over teams. He captained a single T20I on 27 November 2015 against Pakistan, which England won by 3 runs. Buttler was made captain of the England one-day squad in September 2016, stepping in for Eoin Morgan who declined to tour Bangladesh on security grounds. Buttler led a young England side to a 2-1 victory over the Tigers. Buttler enjoyed a prolific cricket record while at school, sharing a record-breaking opening partnership while at King's College, Taunton in 2008, and the following season his school lost only one of seventeen matches under his captaincy, and he was named 2010 Young Wisden Schools Cricketer of the Year. He made his Somerset first-team debut in 2009. His performances led him to be selected to play for England at Under-19 level, touring Bangladesh, and then travelling to New Zealand for the 2010 Under-19 Cricket World Cup. Jos Buttler made his Test cricket debut against India in 2014. Buttler played extensively for Somerset's youth teams, appearing at Under-13, Under-15 and Under-17 level. He made his senior club cricket debut for Cheddar before moving to Glastonbury in the 2006 season, aged just 15, taking three catches and fifteen runs as wicket-keeper. Later in the same season, he made his first appearance for Somerset Second XI, scoring 71 in the second-innings, and taking six catches in the three-day match against Nottinghamshire Second XI. Playing for King's College, Taunton, he finished the 2006 season with the school's leading batting average, scoring 447 runs at an average of 49.66. The following season he played regularly for Glastonbury in the West of England Premier League, and for Somerset Under-17s, for whom he scored two centuries; an unbeaten 119 during a two-day match against Surrey Under-17s, and 110 against Sussex Under-17s. He once again led the batting averages for King's College, with his 358 runs coming at 51.14. The highlight of his school career came in April 2008, when he scored 227 not out during a record-breaking opening stand in a 50-over national schools game, adding 340 with Alex Barrow. He captained King's during the 2008 season, and improved on his batting totals from the previous two years, scoring 851 runs, over 250 more than any other member of the team. His batting average of 94.55 was the sixth highest amongst all school's batsmen reported in Wisden, while his high-score of 227* was the highest score they recorded. During that 2008 season, Buttler also played for Somerset Second XI. With captain Carl Gazzard keeping wicket in the majority of these matches, Buttler played purely as a batsman, although in his final match of the season for the team, he kept wicket and took six catches in the first-innings against Worcestershire Second XI. In the previous match, against Hampshire Second XI, Buttler had made 140 batting from number four. He made his first-class debut for Somerset in September 2009, replacing the injured Justin Langer for the County Championship match against Lancashire, scoring 30 in his only innings. He retained his place in the team for the following Pro40 match against Hampshire, making his List A debut, although he was not required to bat. Selected as part of the Somerset squad for the 2009 Champions League Twenty20, Buttler made his debut in the 20-over format of the game in Somerset's final match of the league stage, remaining six not out at the close of the innings. Buttler again captained King's in 2009, and in the seventeen matches under his leadership they lost only once, and also won the Western School Twenty20 competition. Coupled with his 554 runs for the school at an average of 61.55, and his performances for Somerset, he was named 2010 Young Wisden Schools Cricketer of the Year. When Craig Kieswetter was called up into the England one-day side in 2010, Buttler was given the chance of a prolonged run in Somerset's first team. Brian Rose, Somerset's Director of Cricket, chose not to bring in an experienced keeper to deputise, explaining that Kieswetter had been in a similar position three years earlier, and that he had good reports of Buttler's ability. In his first match of the 2010 season, Buttler remained 22 not out at the close of Somerset's innings, posting his first runs in List A cricket, and he followed this up with two catches to help Somerset beat Glamorgan in their opening Clydesdale Bank 40 fixture. He made his maiden first-class century in his fourth County Championship match, scoring 144 runs in an innings characterised by "dogged determination and [a] decent range of shots". In his next match, he scored his debut List A half-century against Sussex. Buttler joined James Hildreth at the crease with Somerset at 109/4, requiring 183 more runs to win off 129 balls. The pair put on a partnership of 158 runs "to turn the game on its head", with Buttler making 69 in 53 balls. In doing so, they set a new record partnership for the fifth-wicket against Sussex. His continued batting form, which also saw him make scores of 52 and 31* in a County Championship match against Yorkshire, saw him retain his place in the Somerset team upon Kieswetter's return. Buttler was named man of the match in Somerset's Friends Provident T20 semi-final victory over Nottinghamshire at the Rose Bowl, hitting an unbeaten 55 off 23 balls in a partnership of 75 with Kieron Pollard. Buttler's first taste of international cricket came in July 2008, when he represented England Under-17s in two warm-up matches against New Zealand Under-19s. Batting at number five, he scored a rapid 77 not out in the 50-over contest, hitting 11 fours and 2 sixes during the 49 deliveries he faced. He also played in the two-day match between the two teams, scoring 45 in the first-innings as the match was drawn. 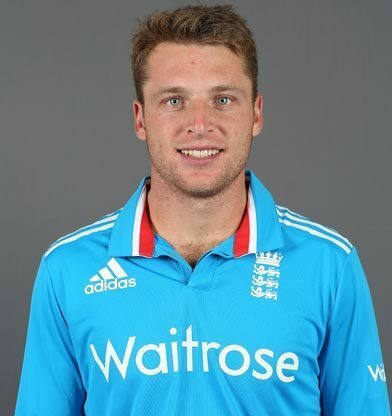 In 2009, Buttler played four matches for England Under-18s, two each against Scotland A and Scotland Development XI. He scored 103 not out in the first of these matches, and made starts in each of the following matches, reaching double figures on each occasion, but not scoring higher than 28. Two months later, Buttler made his England Under-19 debut, appearing in the first Twenty20 against Bangladesh Under-19s. Playing as a specialist batsman, he scored 33 runs off 17 balls as England won by five wickets. During the 2009–10 English winter, Buttler toured with the England Under-19 team. He joined up with the squad in Bangladesh following Somerset's elimination from the Champions League Twenty20 for the seven-match youth ODI series. As with his previous appearance for the Under-19s, Buttler played as a specialist batsman, but failed to make a significant impact until the final match when he scored 42 runs, though Bangladesh still won the match to claim the series 5–2. He remained with the team for the Under-19 World Cup, where he played all but one of England's six matches, keeping wicket in three of them. He scored 91 runs in three innings, with a top-score of 78 against India in the fifth-place play-off semi-final. His batting average of 30.33 ranked him fifth on the England team. In 2011, he was called up to the England Twenty20 International squad for the match against India, but was not required to bat in a six wicket England victory. Buttler was again called up to the Twenty20 International squad for the two matches against the West Indies in September 2011, Buttler again was not required to bat in the first match. The second match of the series saw Buttler score just 13 runs as England lost by 25 runs. In September 2011, Buttler was called up to the Twenty20 International squad for the match against India in the return series. he was not required to bat as England won by six wickets. He was included in the squad to play Pakistan and played in all three games, although he only scored 17 runs in the entire series, which England won 2–1. He played in the 7 wicket win over the West Indies. During the winter of 2011, Buttler was called into the England winter performance programme for a batting and wicket-keeping focussed programme in India, he was also called up for the England Lions tour of Bangladesh. The Lions lost the ODI series 3–2 with Buttler topping the Lions runs and averages charts with 161 runs at an average of 53.66 and also taking the most catches, 6 and most stumpings, 3. 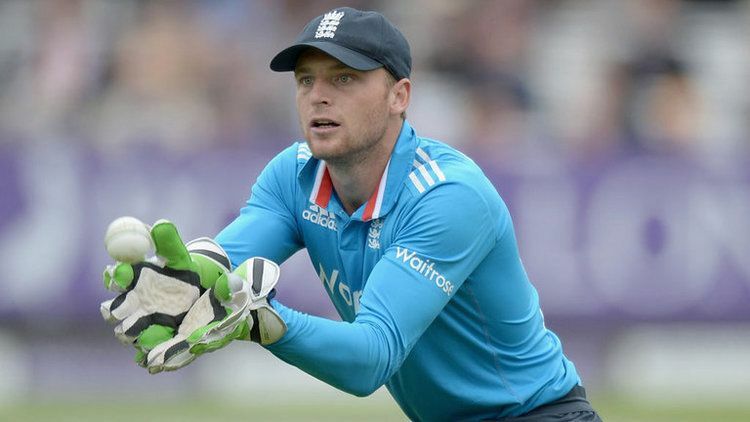 Following his impressive individual performances in Bangladesh Buttler was called up for the Lions tour of Sri Lanka. He was included in the squad to play Pakistan and played in all three games, although he only scored 17 runs in the entire series, which England won 2–1. He played in the 7 wicket win over the West Indies. 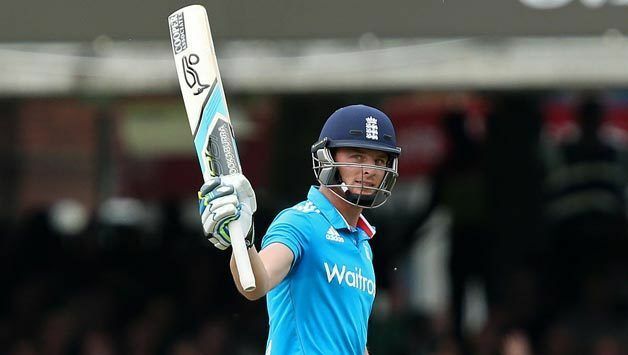 Buttler was called up to the England Twenty20 squad for the series against South Africa. In the final Edgbaston game, Buttler joined Somerset teammate Craig Kieswetter with England on 64–3 with only 16 balls remaining. The pair gave a brutal display of power hitting, raising the final score to 118–5, with Buttler hitting 32 off one over from bowler Wayne Parnell (including two no-balls), the second most expensive over in International Twenty20 behind the 36 of Yuvraj Singh off of Stuart Broad in Durban in 2007. Buttler was selected in the England squad for the ICC T20 World Cup. After making 15 against Afghanistan, he made 11 against India. Although England lost to India they qualified for the Super Eights. He scored 5 not out against New Zealand as England won by six wickets. However, defeat in the next game against Sri Lanka, in which Buttler made 8, meant that England was knocked out of the competition. He was selected for the two T20 internationals against India, and was also given the responsibility of wicketkeeping. He made 33 in the first match, although England lost by 5 wickets. He made an unbeaten 15 in the second match to guide England to a 6 wicket victory. Buttler made his ODI debut in 2012 against Pakistan, but was dismissed for a duck. He played in two further games against India but again failed to make an impression, scoring 14 runs in his only innings. He was selected as wicket keeper for the ODI series against New Zealand, but again disappointed, scoring just 24 runs in the series. He did significantly better in the T20 series, making scores of 54 and an unbeaten 32. His place looked in doubt when he only managed scores of 14 and 2 in the return series against New Zealand. However, on 5 June 2013, Buttler scored 47 runs in just 16 balls in the 50 over match against New Zealand, coming at the end of the innings, the contribution proved vital in securing a 34 run victory for England. He made a quickfire 17 in the T20 series against New Zealand. Buttler was involved in the 2013 IC Champions Trophy after being called up to the squad. However, in the first two group games he made just 1 run. In the final group game against New Zealand he made 14 as England qualified for the semifinals. Buttler did not bat in the semifinal against Sri Lanka which England won, and was out for a duck in the final against India. Buttler showed good form in the first T20 International against Australia, making 27, although he was out for a duck in the second match. Buttler was selected in the England ODI squad to face Australia in 2013. In the second match of the series, Buttler made 75, his highest ODI score and his first international fifty. In the fourth match, Butter hit an unbeaten 65 to guide England to victory and level the series 1–1. In the final match of the series. Buttler made 42, making him one of England's most consistent performers of the series. In the return series in Australia, Buttler made 34 in the first ODI and followed this up with 49 from 36 balls in the second. He helped England win the first match of the tour in the fourth ODI, hitting 71 from 43 balls. England lost all three of their T20 games, with Buttler making scores of 20 and 22 in the first two games. In the final match of the series, England were bowled out for just 84, with Buttler scoring 8. Buttler was selected on the ODI tour of the West Indies. After making scores of 12 and 0, Buttler hit a magnificent 99 off just 64 balls to guide England to victory and hand them a 2–1 series win. In the T20 series, Buttler could only manage 3 in the first game, but then hit 67 in the second match, although it was not enough to win the game. England won the final match before the World Cup, although Buttler could only manage 3 runs. In the 2013 ICC T20 World Cup, Buttler made 32 in an opening defeat to New Zealand. England managed to chase down 190 against Sri Lanka to keep their hopes of qualification alive, although Buttler managed just 2 runs. In the must-win match against South Africa, Buttler hit 34 but England fell three runs short of their target. England suffered further humiliation when they lost to the Netherlands, with Buttler making just 6 runs. Buttler managed just 30 runs in the first two ODIs against Sri Lanka. Butler scored his maiden One-Day International century against Sri Lanka at Lord's on 31 May 2014, in the fourth ODI. He scored it in 61 balls with nine fours and four sixes scoring the fastest century by any England batsman. He was controversially run out by Sachithra Senanayake in the final match of the series after he backed up at the bowlers end. The incident proved controversial, with many England players saying the Sri Lankans did not play within the spirit of the game. After Matt Prior stood down after injury on the 22 July 2014, Buttler was called up for the England squad for the third Test against India. He made 85 from 83 balls on debut to help England win the match and level the series. In the next match he again batted well, making 70 to help set up an innings victory for England as they took a 2–1 lead in the series. He made 45 in the final match of the series to help England win their third consecutive match and win the series 3–1. He also took 11 catches in the series following doubts about his wicket keeping capabilities. In the opening match of the ODI series against India, Buttler could only make 2. However, he performed better in the next match, making 42. Despite this, England lost the match to go 2–0 down in the series. After making 11 in the third match, which England again lost to go 3–0 down in the series, Buttler performed better in the final match of the series, hitting 49 to help England win their first match of the series. 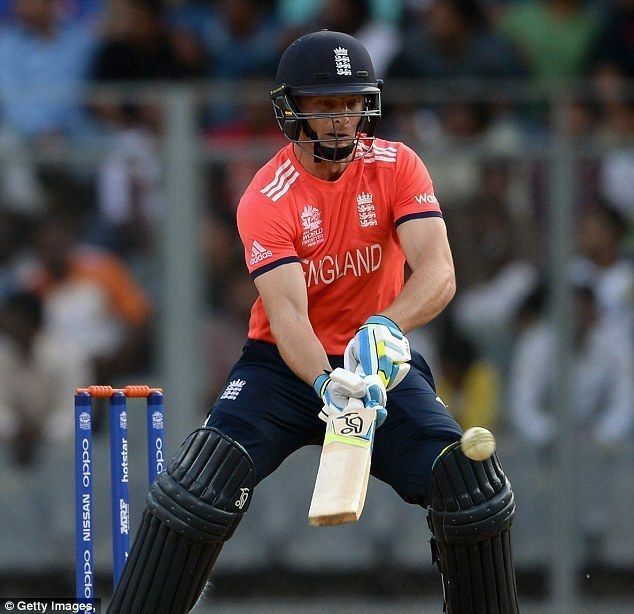 In the only T20 match between the two sides, Buttler could only make 10 but England went on to win the match. Buttler was selected for the ODI tour of Sri Lanka and played in the first two games, making scores of 21 and 7 as England lost the first two games. In the third ODI he guided England over the line with an unbeaten 55. He made 15 in the next match, before hitting the winning runs in the fifth ODI to keep England in the series. In the game, Buttler got off to a decent start but was unable to make a big score, being dismissed for 22. It was a similar story in the final game of the tour, with Buttler being dismissed for 23 as England lost the match and the series 5–2. 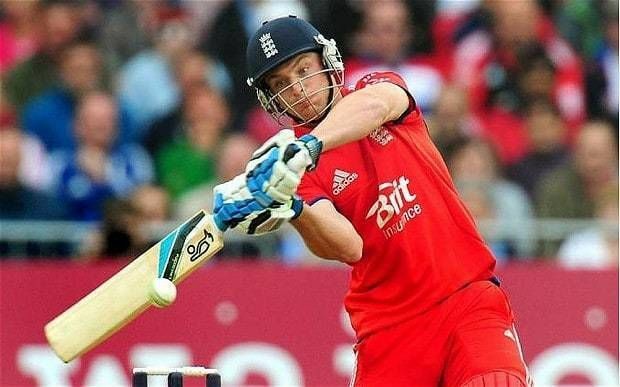 In the opening game of the tri-series against Australia, Buttler made 28 but England lost the game. In the following match against India he was not needed to bat as England secured a comfortable win. In the match Buttler made four catches and also made a stumping. After making 25 in another defeat against Australia, Buttler made his first half–century of the tournament against India, making 67 to help England win and qualify for the final. In the final Buttler made 17 but England lost to Australia yet again. Butler made just ten as England lost their opening match of the World Cup against Australia. In the following match he was dismissed for three as England were bowled out for just 123 against New Zealand, to lose their second consecutive match. He made 24 against Scotland as England won their first match of the tournament, but pundits argued he should have been moved up the order. This sentiment was repeated after he scored a brisk unbeaten 39 against Sri Lanka. However, England were unable to defend their score and Sri Lanka won the match by nine wickets. In their must win game against Bangladesh, Buttler scored 65 but was not able to get England over the line and they were eliminated from the competition. In the final game against Afghanistan Buttler was not need to bat as England secured a nine wicket win. Buttler was included in the squad that toured the West Indies, cementing his place as England's first choice Test wicket-keeper. In the first innings of the first Test he was dismissed for a duck, but then hit an unbeaten 59 in the second innings to help put England in a strong position. However, the West Indies batted out the match to secure a draw. In the second match Buttler made 13 in the first innings, and was not required to bat again as England secured a comprehensive nine wicket victory. In the third Test Buttler remained not out on three in the first innings as England's tail collapsed. He was again left stranded in the second innings on 35 not out. England went on to lose the match as the West Indies chased down their target to win the match by five wickets and level the series at 1–1. In the two-Test series at home against New Zealand, Buttler made 67 in England's first innings to help them recover to post 389. He made 14 in the second innings as England went on to win the game to take a 1–0 series lead. In the second Test he could only manage ten in the first innings, but did top score in England's second innings with 73. England went on to lose the game and the series was tied at 1–1. 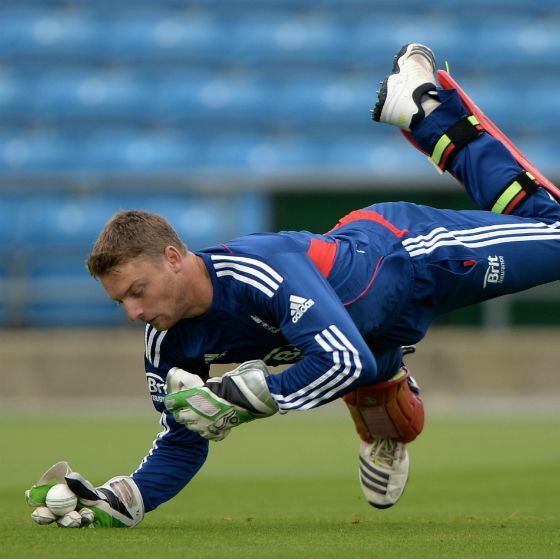 Buttler continued in his role as wicket-keeper in the five-game ODI series against New Zealand. He started the series strongly, scoring 129 off only 77 balls and taking one catch as England won by 210 runs. Buttler made 41 and took one catch in England's subsequent defeat by 13 runs (D/L method) in a very close match. He then had an unsuccessful third match, scoring only 13 and taking no catches as England lost again. In the fourth game he was not needed to bat as England secured a convincing seven wicket victory to level the series. Injury ruled Buttler out of the deciding match, which England won, and the only T20 match between the sides, which England also won. Buttler had a generally poor Ashes series with the bat. In the first Test he scored 27 in the first innings but was dismissed for just seven in England's second innings. Despite this, England recorded a comfortable win. In the next Test England lost by 405 runs and Buttler failed to make an impression with the bat, scoring just 24 runs in the match. He scored nine in the first innings of the third Test and was not need to bat in the second innings as England secured an eight wicket win. In the fourth Test Buttler made 12 in the first innings as England won by an innings and 78 runs. Buttler only made one in England's first innings of the final Test, but scored 42 in the his final innings of the series, which also proved to be his highest score of the series. England went on to lose the game but won the series 3–2. Buttler's batting during the Ashes series was criticised by Boycott, saying "Jos Buttler is like a rabbit caught in the headlights of Ashes cricket. A seven-year-old schoolboy would have played better. He hasn't made a run all series. He hasn't shown any application whatsoever. It looks to me like his mind and confidence is shot for Test cricket – it's pathetic." Buttler played in the only T20 between the two sides, scoring 11 as England won by 5 runs. Buttler appeared in the first two ODI games against Australia, before injury ruled him out of the rest of the series. England lost both games, with Buttler failing to make a significant score in either match, being dismissed for 0 and 4. Buttler played in all four ODI matches against Pakistan. He struggled in the first game, scoring just one as England lost the opening match. However, after scoring eleven in the second match, Buttler hit an unbeaten 49 in the third ODI to send England on their way to a 6 wicket victory. He scored a fantastic unbeaten 116 in the final match of the series, helping England to score 355–5. Pakistan could not get near the victory target and lost by 95 runs, meaning England won the series 3–1. He played in two of the three T20Is, making scores of 33 and 2 as England won both games. Buttler played in the ODI series against South Africa, and he scored his second consecutive ODI hundred as he hit 105 in England’s score of 399 against the hosts, and England went on to win the match comfortably. He hit an unbeaten 48 in the second match as England went 2–0 up in the series. However, Buttler then suffered a loss of form, scoring just one run in his final three innings of the series, and England went on to lose all three games to hand the series to South Africa 3–2. In the T20 World Cup, Buttler made a score of 30 in the opening game defeat against the West Indies. He followed this up with 21 against South Africa as England chased down 230 to secure a historic win. He was out for just six against Afghanistan, although England won the match to keep their qualification hopes alive, and he then hit 66 against Sri Lanka to help England reach 171–4 and qualify for the semi-finals. In the semi-final he hit an unbeaten 32 to help guide England to a seven wicket victory. England lost the final against the West Indies, with Buttler making 36. 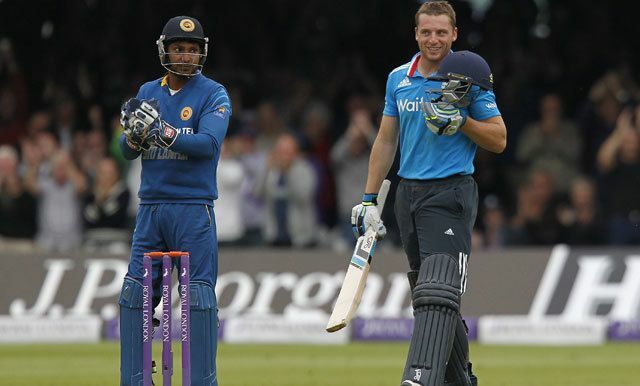 Buttler scored 93 in England's first match against Sri Lanka, helping them tie the match. He did not bat in the second match as England won by ten wickets, and was also not able to bat in the third ODI, as rain ended England's innings early and the match ended in a draw. He scored an unbeaten 17 in the fourth match of the series to help England over the line to record a six wicket victory, and he made 70 in the final match of the series to help England reach 324 and win the match by 122 runs. In the only T20I between the two sides, Buttler opened the batting and scored an unbeaten 73 to help England to an eight wicket victory. Buttler was not required to bat in the first ODI against Pakistan, as England won by 44 runs on the D/L Method. He only made 4 in the second match, but returned to form in the third ODI as he hit an unbeaten 90 to help England to a record score of 444/3, which was the fastest half-century by an Englishman. Buttler missed the final two games of the ODI series, which England won 4–1, through injury. He returned for the T20I between the two sides, where he made 16 as England lost by nine wickets. Buttler captained the side in the ODI series against Bangladesh. In the first ODI he made 63 to help England to 309 and a 21 run victory. In the second ODI he made 57 but it wasn’t enough to prevent an English defeat. In the final match of the series, Buttler made 25 as England chased down Bangladesh’s target of 278 and won by four wickets. Buttler returned to the England Test side for the third Test against India, where he made 43 in England’s first innings total of 283. He made 18 in the second innings as England lost by 8 wickets. In the fourth Test he made 76 in England’s first innings, and made six not out in the second innings as they lost by an innings and 36 runs. In the final Test he made 5 in England’s first innings total of 477, and was left unbeaten on six in the second innings as England collapsed to lose by an innings and 75 runs, to lose the series 4-0. Buttler made 31 as England posted 350/7 in the first ODI, although they lost by three wickets. In the second match he was out for ten as England lost by 15 runs. He made 11 in the next match as England made 321/8 to win by five runs. He did not bat in the first T20I which England won by seven wickets. He made 15 in the next match although England lost by five runs. He was out for a duck in the final match of the series as England were all out for 127 and lost the match by 75 runs. Buttler made 14 in the first ODI against the West Indies as England won by 45 runs. He was out for a duck in the second match as England secured a four wicket victory. In the final match of the series he made 14 as England made 328 and won the match by 186 runs. A tall and strongly-built cricketer, Buttler has an upright stance in the crease. During his century against Hampshire in 2010, he "hit the ball hard and straight", "moving his feet decisively, playing with his bat close to his body and selecting the right balls to attack". After that innings, his Somerset captain Marcus Trescothick suggested that Buttler could challenge teammate Craig Kieswetter's place in the England team. 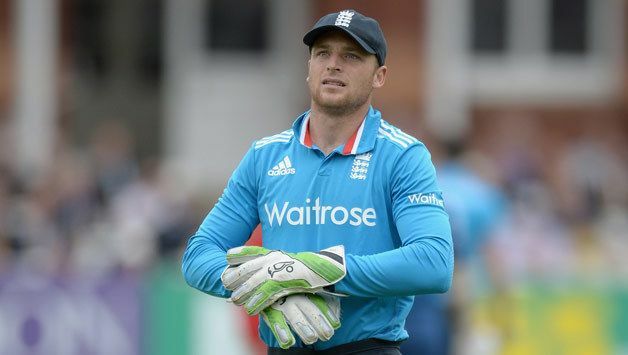 With Kieswetter's and Matt Prior's retirements in 2015, Buttler became the no.1 wicketkeeper for all forms of the game. However, due to Alec Stewart's precedence of poor test averages as a wicketkeeper, and many other former wicketkeepers having better test averages after being relieved of their wicketkeeping duties (Sangakkara, McCullum), there has been suggestions for Buttler to give up keeping for tests, with Sam Billings (who has yet to make his test debut as of 21 November 2016) or Jonny Bairstow replacing him. Ironically, despite Buttler's improved glove-work, Bairstow replaced him for the third ODI for Australia's English and Irish Tour due to his poor form with the bat throughout the Australian series. Bairstow eventually became the outright wicketkeeper for Tests in December 2015 for the series against South Africa. He was dropped from tests altogether in 2016 during Sri Lanka's tour of England and Ireland, while Bairstow's test centuries started piling up for county (Yorkshire) and country in 2016.